This section is intended to help you generally navigate around the Outlook 2013 application window and understand how to find and use basic functions. The main Mail window is divided into four different sections. In the image below they are outlined by separate colors and numbered. Navigation (Red) - This part of the window on the far left allows you to navigate through different parts of the Outlook 2013 program. You may select between the different folders of your email, such "Inbox", "Sent Items" and others. At the bottom of the Navigation pane is a group of options that allow you to move between the multiple areas of the Outlook application (starting with "Mail", yellow showing it is currently being viewed). Messages (Blue) - This middle section shows all of the mail currently stored in whatever folder is selected in the Navigation pane. As shown, it is arranged in Conversation View. If you would like to change this to the older, chronological ordering of Blitzmail, click where it says "Arrange By: Conversations" at the top of the Messages window and select "Date Received". Reading Pane (Yellow) - This is where the material contained in each email is displayed. If you click on an email once in the Messages section it will be displayed on the far right. Double clicking on the message in the Messages section will cause it to appear in a new window. 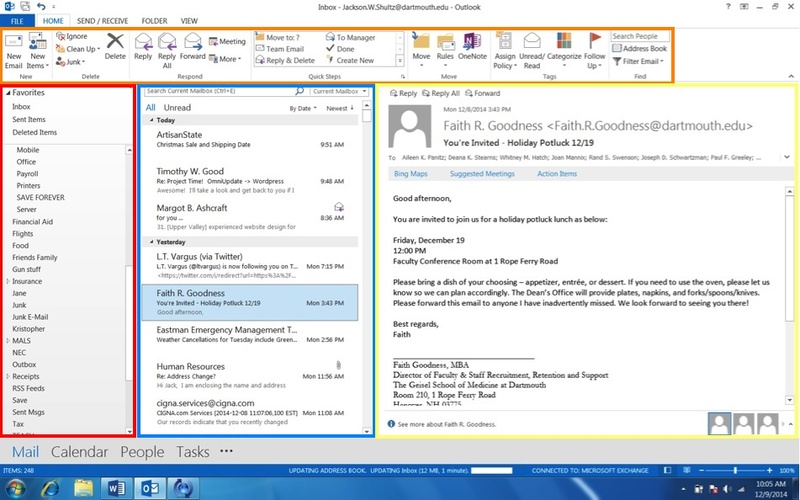 Actions (Orange) - This "ribbon" at the top of the Outlook window contains buttons for common commands or actions. Clicking "New E-mail" will automatically create a new message window for you. Clicking "New Items" will show a drop-down menu of different items that are part of Mail, Calendars, Contacts, etc. Clicking "Reply" or "Reply All" will create a new window that is addressed to the sender or all Contacts included in the message being viewed. Clicking "Forward" will create a new window and you can enter in the Contact that you would like the message forwarded to. Clicking "Meeting" will create a new window for sending a Meeting Request to the original sender(s) of the message being viewed. Clicking "Move" will relocate a selected message to a different folder. Clicking "Rules" allows you to create rules regulating how Outlook Mail receives and sorts your incoming email messages. Clicking "Unread/Read" will change the status of an email message to "unread" or "read". Clicking "Categorize" provides you with various labeling options for your messages. Clicking "Follow Up" will designate a message as needing further attention. You can set when you need to follow up on the message and if you would like a reminder sent to you at that time. Clicking "Filter Email" displays options for sorting the messages displayed in the Message section. Navigation (Red) - On the far left of the Outlook application window, this section will help you search through your various calendars. Content (Blue) - This largest portion of the main Calendar window contains all Appointments and Meetings for the time period you have displayed. You can double click anywhere in this section of the Calendar window to create a new window for scheduling events. 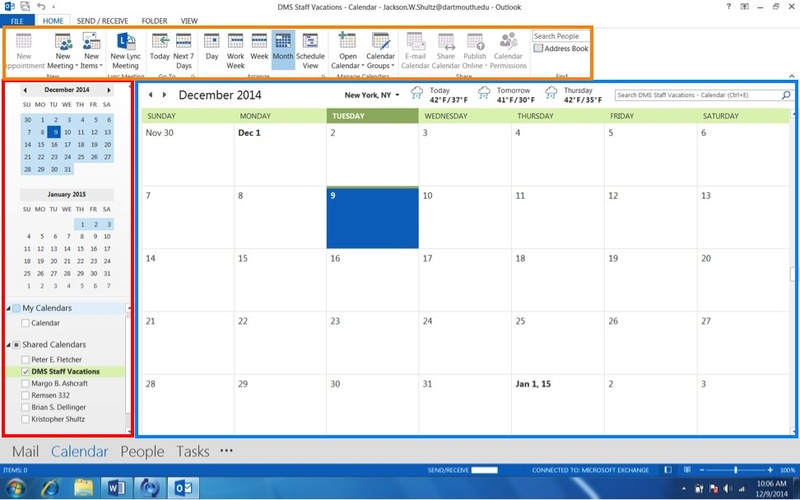 Actions (Orange) - This "ribbon" at the top of the Calendar window contains a series of buttons that can be used to perform basic actions within the Outlook Calendar. Clicking "Meeting" will create a new window for adding a Meeting to your Calendar. You must add Contacts in the "To..." field of the new window in order to send them invitations to add the event to their Calendar as well. Clicking "Appointment" will create a new window that will add an event to your Calendar only. At the top of the Appointment window is another "ribbon" that includes a calendar icon called "Invite". Clicking this button will change your Appointment into a Meeting with invitations sent to the Contacts including in the new "To..." field. Clicking "New Items" creates a drop-down menu of different items that are part of Mail, Calendars, Contacts, etc. Clicking "Today" will automatically view the current date within the Content part of the Calendar window. Clicking "Next 7 Days" displays a weekly calendar. Clicking "Day" makes the Content section display only one day at a time. Clicking "Work" makes the Content section display only the days Monday through Friday. Clicking "Week" makes the Content section display only one week at a time. Clicking "Month" makes the Content section display a whole month at once.